Starhopping guide to the Andromeda Galaxy. One of the greatest puzzles for anyone who has just acquired a telescope is how to find objects in the night sky. They have seen all the beautiful pictures in books, magazines, and the internet, and want to see these wonders with their own eyes through their new telescope. But where to begin? The method most amateur astronomers use to find objects in the sky is called starhopping. This involves navigation from bright, easily seen objects, stars, to faint, hard-to-see objects, such as galaxies. To understand how this works, let?s go through the process step by step, using it to locate and observe the Andromeda Galaxy, number 31 in Messier's famous catalog of deep sky objects. There are several tools which will help this process. The first is a good star chart, such as this one produced by Starry Night. A good star atlas, such as Sky & Telescope's Pocket Sky Atlas, will do as well. The difficulty with all star charts is that they represent the skies on a much smaller scale than the real thing, and beginners often find it difficult to relate the stars they see to the chart on paper. For example, The Square of Pegasus, in the lower right of this chart, is much larger in the sky than it appears on the chart. It helps to print out star charts on a large scale. An absolute essential is a good dark sky. This means getting away from light pollution, which will obscure all but the very brightest deep sky objects. Note that light pollution definitely includes moonlight: one reason for hunting Andromeda tonight is that there will be no moon to spoil the view. You will need a red flashlight to study your chart; a white light will spoil your dark adaptation and make it impossible to see faint objects. A binocular, 7x50 or 10x50, is very helpful in "practicing" the starhop before you attempt it with your telescope. A hand-held binocular is much easier to handle and point than a mounted telescope. Starhopping involves finding a path from bright star patterns to the fainter objects you are looking for. There is often more than one path to be found, and different observers will find their own paths which work best for them. To get you started, we will talk you through two paths to the Andromeda Galaxy. The chart represents the sky as seen from a mid-northern latitude in late October, around 11 p.m. local time. You are facing south, but looking almost overhead. 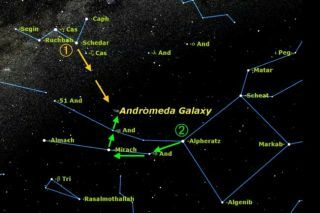 The first path to Andromeda starts from the constellation Cassiopeia (upper left in the chart). This is a circumpolar constellation, which means that it is always above the horizon at mid-northern latitudes, opposite the North Star, Polaris, from the Big Dipper. Its five second-magnitude stars form a distinctive "W" shape. We can use the right side of the ?W? as an arrow head pointing towards the Andromeda Galaxy. Using the height of the W as a measure, go three W heights in the direction the arrow head points, and you will be close to the Galaxy. With a binocular and a dark sky, Andromeda will appear like a small pale puff of smoke, slightly elongated. The second path to Andromeda requires a bit more star knowledge, but will get you more precisely to the right spot. This path starts with the Great Square of Pegasus (lower right in the chart). This large square of second magnitude stars is high in the southern sky on October evenings. Sprouting from the upper left corner of the Square are two chains of stars which make up the constellation Andromeda. The brighter of these chains starts at Alpheratz (Alpha Andromeda, the upper left corner of the Square) and moves to the left to encompass Delta Andromedae, Mirach, and Almach. To get to the Andromeda Galaxy, start at Alpheratz and proceed along the chain past Delta Andromedae to Mirach (Beta Andromedae). At Mirach, hang a sharp right turn to Mu Andromedae, and then go past Mu the same distance as Mirach to Mu. That will put you exactly on the position of the Andromeda Galaxy. Practice these paths several times with binoculars, and then repeat the one which works best for you using the finder of your telescope. With your lowest power eyepiece in place, sweep the area carefully until you detect the faint glow of the Galaxy. It may take several attempts until you can see the Andromeda Galaxy, since our eyes are not used to looking at such faint objects. Patience is the key to finding deep sky objects. You may not succeed on your first night out, if so, try again the next clear night. Once you get the hang of it, finding Andromeda will become something that you can do with ease every night, and impress your friends and family. It?s the first step to a real familiarity with the night sky.